Jeep Wrangler YJ Hood Bumpers. Sometimes in life, its the little things that count. Jeep Wrangler owners can attest that the factory hood bumpers are just not up to par. They are known to dry out, fall out, and are not reusable once they have been removed. 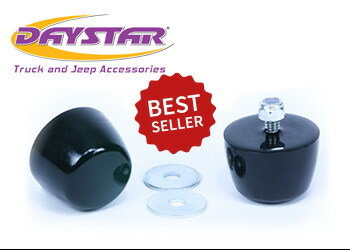 Daystar Products has come to the rescue with our brand new Wrangler hood bumpers that are made out of our extremely tough and durable polyurethane construction.